Abstract: Beyond the Internet of Things that is emerging today lies the Internet of Everything—the vision of pervasive, ubiquitous computing, of a digital sensory layer enveloping the world. Realizing this vision relies on expanding our capability to place computation in the world, to then network these sensors, to manage them, and most challengingly, to power them. Biography: Pat Pannuto is currently completing his PhD in the Department of Electrical Engineering and Computer Sciences at the University of California, Berkeley. He received his MSE in Computer Science and BSE in Computer Engineering from the University of Michigan. Pat’s research is in the broad area of networked embedded systems, with contributions to computer architecture, wireless communications, mobile computing, operating systems, and development engineering. 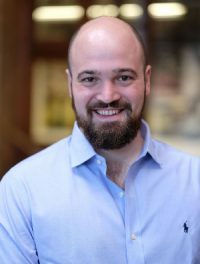 Pat’s work has been recognized as a Top Pick in Computer Architecture and selected as a Best Paper Finalist at IPSN, and has been awarded NSF, NDSEG, and Qualcomm Innovation fellowships. Pat has also received teaching awards from the Computer Science Department, the College of Engineering, and the Rackham Graduate School at the University of Michigan.